Since annexation in 1959 every Chinese leader had suppressive policies in Tibet. In recent times Hu Jintao has been the worst. Beijing's policy has been to hold on to Tibet by any possible way whether its severe repression, shootings, imprisonment with absolutely disregard of the Tibetan people's basic rights and in the last fifty five years continue this policy with no real intention ever to settle the Tibetan issue. So for many Tibetans the only route out is independence as there is no other choice as the Tibetan people cannot live under the yoke of the Chinese communists. We have been involved in dialogue with Beijing in the past. Yes dialogue is important but with a purpose not Beijing's dialogue which is one sided only to serve their interests of no settlement and prolonging time. 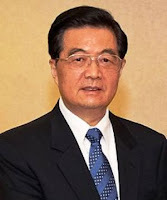 During his tenure as Party Secretary of the Tibet Autonomous Region (TAR), Hu Jintao established his credentials as a tough administrator of Beijing's control mechanisms in Tibet, including the use of deadly force against unarmed protesters and the imposition of martial law in Lhasa. Hu Jintao was appointed Party Secretary of the TAR in December 1988, a position he held, mostly in absentia, through 1992. It is clear that Beijing wanted someone solid who could be trusted to rigorously implement Party policies in the restive region. Hu Jintao's Tibet appointment was announced on December 9, 1988. The following day, perhaps in response to the announcement, a large demonstration rocked Lhasa, Tibet's capital city. People's Armed Police opened fire on the demonstrators at close range, killing several thousand Tibetans who carried Tibet's outlawed national flag. Hu Jintao arrived in Lhasa in mid-January 1989 and one of his first meetings was with a Tibetan Buddhist leader, suggesting that he may have wanted to be seen as respectful of Tibetan religious sentiments. On January 23, Hu traveled to Shigatse, the seat of the Panchen Lama, to participate in a meeting convened for his behalf. He sat next to the Panchen Lama and announced that he "considered himself a member of the Tibetan people" and "would share a common fate with the Tibetan people and work wholeheartedly for their benefit." Incredibly, the Panchen Lama used the occasion to deliver a scathing report on China's administration of Tibet, declaring that Chinese rule had resulted in more harm than benefit to Tibetans. It was a daring speech that startled the Chinese and came to be seen as a defining critique of modern Tibet. A few days after the meeting, the Panchen Lama died at Tashi Lhunpo, his monastery in Shigatse. Hu Jintao had some hand in the unexpected death of the Panchen Lama. The March 2008 riots all over Tibet saw thousands of Tibetans shot and imprisoned. The order to suppress the uprisings came directly from Hu Jintao. The Chinese leadership and people should see that the international community has recognized the persecution of the Tibetan people as being illegal. The people who have carried out and implemented the persecution order will receive just and historic trials for their involvement in the persecution." Most Communist officials who have participated in the persecution should understand that they will be punished by law and calling upon those who have been involved in the persecution to atone for their crimes. This will also create a precedent for future Chinese leaders. China's legality and legitimacy on Tibet has been tested since the day Tibet was invaded in 1950.Till date China's hold on Tibet has been shaky and a true solution to the Tibet issue is a more measured" approach to Tibet, to include effective dialogue with the Dalai Lama, given that "only the Dalai Lama" can settle the current bleak situation and unify the majority of the Tibetan community both within China and abroad. NOTE--The author is a former member of the Tibetan Parliament-in-Exile. This article was presented at the international conference: China's New Leadership Challenges for Human Rights, Democracy and Freedom in East Turkestan, Tibet and Southern Mongolia on March 12, 2013 in Geneva. Absolutely stupid post!! Can't even believe this guy was a Tibetan official at one point. Brainless is his article, you r talking about the former head of the probably the strongest nation after USA.